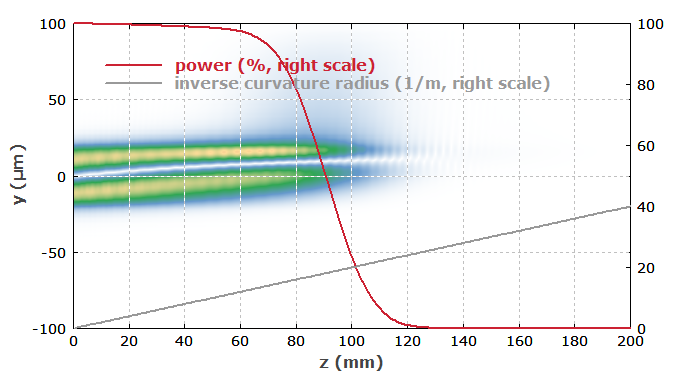 Here we show how RP Fiber Power can be used to analyze bend effects in fibers. We consider a fiber with a simple step-index design: a core radius of 20 μm and a low numerical aperture of 0.05. At a wavelength of 1 μm, that design supports several guided modes, but one can try to operate it with the fundamental mode only. 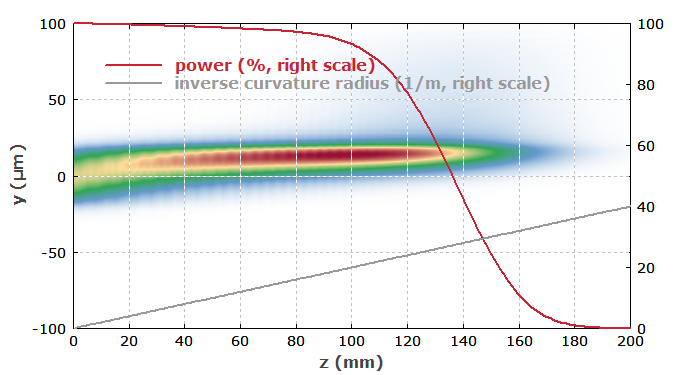 For the beam propagation, we use a relatively large grid and simulate losses for cladding modes as an absorption which increases steeply with increasing distance from the core. Initially, we assume that the bending becomes tighter and tighter along the length of the fiber. The launched light is entirely in the fundamental mode. We then let the inverse curvature radius increase linearly with the distance. Figure 1 shows the amplitude distribution in the y-z plane. Figure 1: Amplitude distribution along the fiber for increasing bending. One can see that the intensity profile of the guided mode is more and more pushed away from the fiber axis, and that the optical intensity rises due to a reduction in mode area. After 100 mm, the mode area is only about half the original mode area. From that point on, the losses become quite large: light is more and more coupled out into cladding modes. We see that the bend losses become critical when the bend radius reaches the order of 50 mm. We can do the same for the LP11 mode, see Figure 2. Here, the bend losses set in earlier, and basically all power is lost already after 120 mm. Figure 2: Same as Figure 1, but for the LP11 mode. 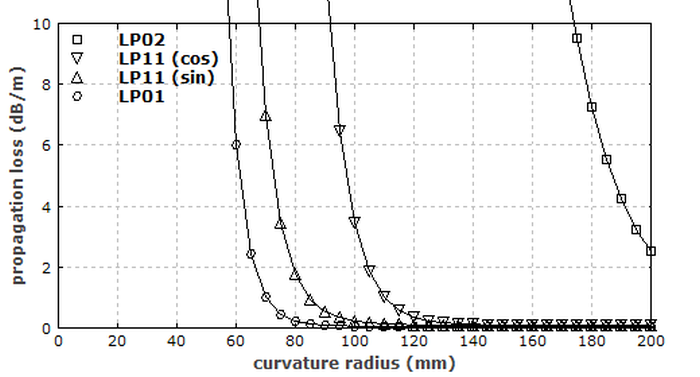 Figure 3: Bend losses as a function of the bend radius for different guide modes of the fiber.